Made In Japan. Live And Dangerous. Live In The Heart Of The City. Exit Stage Left. Name your own favourites. Back in the day, the live album was a key landmark in a rock band’s development – a bringing together of material from across their repertoire, in communion with their audience. On a magical night in Glasgow back in May, in front of a crowd frequently going nuts, King King captured a performance well worthy of the genre. Great live albums have key ingredients that make them distinctive: previously unreleased material perhaps; different arrangements of songs that show off their evolution; and crucially, an electricity that comes from something being created in the moment, in front of a crowd. King King Live ticks all the boxes. In spades. After the rousing opener of ‘Lose Control’, we get something new, or at least something borrowed, with a belting cover of the Fabulous Thunderbirds’ ‘Wait On Time’. Propelled by a walking bass line from Lindsay Coulson, it’s classic R&B with a twist of funk – and not the last time that they show off their command of the latter. You’ll pick your own highlights, but ‘Long History Of Love’ is one of mine, here extended to over ten minutes without ever disappearing up its own backside. It may not have the reflective, delicate quality of the studio version, but it makes up for that with a fresh and soulful organ solo from Bob Fridzema, and an urgency and passion that give it a different, gripping character. They go large on ‘Stranger To Love’ too, closing the set proper, but it’s still a noodle-free zone – though newcomers may be puzzled by the moments in which Alan Nimmo’s trademark near-silent guitar solo delves into the auditory range of canines. standout track, ‘You’ll Stop The Rain’, introduced by Alan Nimmo as a tip of the hat to his brother Stevie. The lyrics are meaningful, the vocal delivery sincere, and to top it off Nimmo delivers a searing solo with climactic tension and release. It was sensational on the night, and it’s sensational here. Elsewhere they bring their funky swagger to ‘All Your Life’ and the good time encore of ‘Let Love In’, and if these don’t make you feel like dancing then you’re dead from the waist down. ‘All Your Life’ in particular epitomises how tight but loose they’ve become – in a groove, but relaxed with it. Across the album you can hear what the whole band contributes: Lindsay Coulson’s bass bubbling away in varying styles; Wayne Proctor’s drums adding punctuation and power, bringing oomph to the likes of ‘More Than I Can Take’ and ‘Crazy’; and Fridzema adding surging organ, flourishes of piano, and solos to complement Nimmo’s guitar, as on ‘Jealousy’. And all of this is highlighted by clear, unfussy production that brings the right sounds to the fore at the right time. I love Deep Purple, Led Zeppelin, Bad Company, all those bands of yesteryear. But let’s face it, that was then. 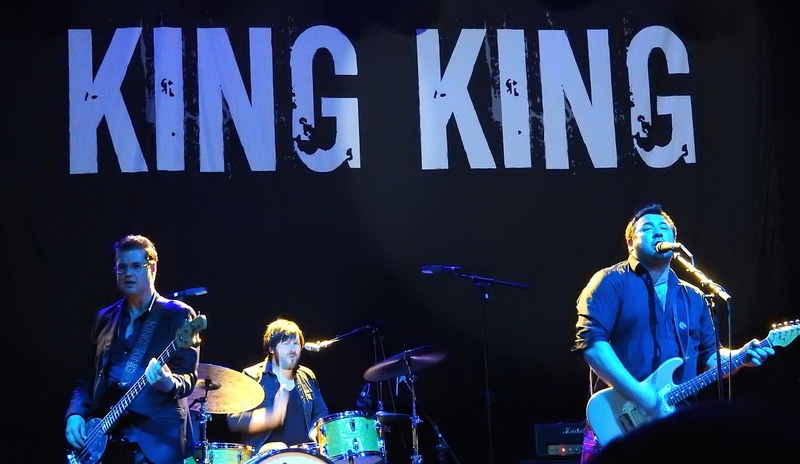 King King Live is the living, breathing, here and now of classic rock. And it’s the business. King King - Live is released by Manhattan Records on 21 October. Available for pre-order from Amazon now.